Jeremy Shaffer "J.R." Roenick (born January 17, 1970) is a retired American professional ice hockey player who played the majority of his career in the National Hockey League (NHL). He played for the Chicago Blackhawks, Phoenix Coyotes, Philadelphia Flyers, Los Angeles Kings, and San Jose Sharks over the course of his 18 NHL season career and represented Team USA in numerous international tournaments. On November 10, 2007, he became the third American-born player (Joe Mullen and Mike Modano are the other two) to score 500 goals. Roenick began playing hockey at the age of four when the parents of a playmate persuaded Roenick's parents to put Jeremy in a hockey program so that their child would be with someone he knew. The son of a Mobil oil district coordinator, Jeremy constantly moved around the Northeastern United States, joining new hockey teams with each stop. Roenick’s impressive play while, living in Fairfax, Virginia, earned him an offer to play for the Bantam level New Jersey Rockets, who had won back to back national championships in 1984-85 and 1985-86. At age 14 Roenick was forced to take a flight from Dulles Airport to Newark, NJ on a weekly basis to make the Rocket’s games. Roenick helped the Rockets to a state championship registering 300 points in only 75 games. After one year of traveling for hockey the Roenick family would move back to Massachusetts, where Jeremy enrolled at Thayer Academy. Roenick played on the same line as future NHL line-mate Tony Amonte; the two went on to win two state championships. Roenick so impressed during his time at Thayer Academy that he was drafted straight out of high school, going eighth overall in the 1988 NHL Entry Draft to the Chicago Blackhawks. He was also taken to breakfast by Wayne Gretzky in an attempt to convince Roenick to play for the Hull Olympiques, a QMJHL team that Gretzky owned. Roenick played for the Olympiques during the 1988-89 season scoring 70 points in 28 games, before going on to represent the United States at the 1989 World Junior Championship. In his second WJC Roenick lead the tournament in scoring and was named a Tournament All-Star. Roenick’s line, which included future NHL players Mike Modano and John LeClair, totaled 41 points the most ever by a Team USA line and sixth most in tournament history However despite his scoring success the United States finished the tournament in fifth place. During the tournament Roenick become the all-time leading American scorer totaling 25 points. Roenick’s recorded stood for 21 years before being broken by Jordan Schroeder in 2010; however it took Schroeder three tournaments to pass Roenick who set the record in just two events. 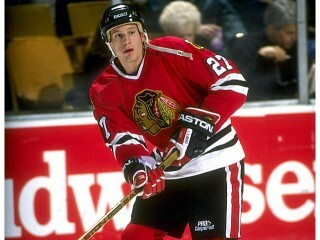 Following Roenick’s successful WJC performance the Blackhawks called him up during the 1988-89 season. Roenick made his NHL debut on October 6, 1988 against the New York Rangers and then scored his first goal on February 14, 1989 against the Minnesota North Stars. In 20 games at the NHL level, Roenick scored 18 points. In the playoffs, he helped the Blackhawks reach the Conference Finals. During the playoffs Roenick gave the Chicago fans' a glimpse of what kind of player he would become. In a game vs. the St. Louis Blues Roenick got into an altercation with Blues defenseman Glen Featherstone. Featherstone crosschecked Roenick in the mouth and broke his front teeth; Featherstone would be given a five min. major while Roenick received a minor. Roenick remained in the game and once his penalty expired he took a shift on the power play and scored a goal. In the 1989–90 season, Roenick joined the Blackhawks full-time and helped the team improve 22 points to win the Norris Division title. He scored 26 goals and 66 points. During the playoffs, Roenick helped the Blackhawks reach the Campbell Conference finals before losing to the Edmonton Oilers. He scored 18 points in 20 games. The Blackhawks' confidence in Roenick's abilities allowed them to trade Denis Savard for defenseman Chris Chelios in late 1990. In 1990–91, Roenick paced the team with ten game winning goals as the Blackhawks improved another 18 points to win the Presidents' Trophy. Roenick finished second on the team with 41 goals, 53 assists and 94 points and played in his first NHL All-Star Game. In six playoff games, he scored eight points. The following year, Roenick led the team with 53 goals, 50 assists and 103 points and played in his second All-Star Game. While the team dropped to second in the Norris Division during the regular season, they marched all the way to the 1992 Stanley Cup Finals in the playoffs. Roenick scored 22 points in 18 games as the team captured the Clarence S. Campbell Bowl over Edmonton before getting swept by the Pittsburgh Penguins in the final round. In 1992–93, Roenick led the Blackhawks with 50 goals, 107 points and 22 power-play goals as the team improved 19 points to win their third Norris Division title in four years (47 wins, 106 points). During the season, Roenick played in his third All-Star Game. In the playoffs, he scored three points in four games as the Blackhawks were swept by the St. Louis Blues. At year's end, he ranked tenth on The Hockey News' Top-25 Players list. In 1993–94, Roenick again led his team with 46 goals, a career-high 61 assists, 107 points, a career-high 24 power-play goals, five shorthanded goals and a +21 plus/minus rating as the Blackhawks fell back 19 points in the standings. He also played in his fourth mid-season All-Star Game. In the post-season, he scored seven points in six playoff games. At year's end, he ranked tenth on The Hockey News' Top-40 Players list. He also won the Chicago Sports Profiles Humanitarian of the Year Award. In the shortened 1994–95 season, Roenick scored 34 points in 33 games. He missed 15 games with a bruised tibia. He played eight games in the playoffs as the Blackhawks reached the Western Conference final where they fell to the Detroit Red Wings. In 1995–96, Roenick scored 67 points in 66 games before missing the last 11 games with a sprained ankle. At year's end, he was the team's leader with 32 goals. On August 16, 1996, Roenick was traded to the Phoenix Coyotes for Alexei Zhamnov and Craig Mills. In his first season with his new team, Roenick scored 29 goals and 69 points. In 1997–98, he finished second on the team with 56 points. In 1998–99, he led the Coyotes with 72 points and played in his fifth All-Star Game while also knocking 154 hits. In 1999–00, Roenick again led the Coyotes in scoring, this time racking up 34 goals and 78 points. He tallied 125 hits on the season and played in his sixth All-Star Game. In 2000–01, Roenick led the Coyotes with 30 goals and 76 points. He played 80 games and knocked 133 hits. On July 2, 2001, Roenick signed as a free agent with the Philadelphia Flyers. In his first season with the Flyers he won both the Bobby Clarke Trophy (MVP) and Yanick Dupre Memorial (Class Guy) team awards. He led the team with 46 assists, 67 points, and a +32 plus/minus rating as the Flyers won the Atlantic Division title. On January 30, he scored his 1,000th NHL point in a game against the Senators. Three nights later, he played in the mid-season All-Star Game. In the playoffs, Roenick played five games in an opening-round loss to the Senators. In 2002–03, Roenick led the Flyers with 27 goals and 59 points as the team won 45 games and finished second in the Atlantic Division. He also co-led the Flyers with 32 assists and eight power-play goals. On November 16, Roenick played in his 1,000th NHL game. In February, he played in the mid-season All-Star Game. In the playoffs, he scored eight points in 13 games as the Flyers reached the second round before losing to the Senators. On February 12, 2004 during a game vs. the New York Rangers, Roenick would be hit in the face by an errant slapshot from Rangers defensemen Boris Mironov. The force of the shot broke Roenick's jaw in 19 places and knocked him unconscious for several minutes as he lay on the ice in a pool of blood. Roenick suffered his ninth concussion on the play, and there was concern that he had suffered damage to his brain's circulatory system, in addition to the broken jaw, leading him to consider retirement. Further testing revealed no circulatory damage and Roenick returned ahead of schedule, after missing more than a month of hockey due to the concussion and broken jaw, with less than two weeks left in the season. In 2003–04, Roenick was limited to 62 games, but still scored 47 points as the Flyers won their third division title in five years. He finished second on the team with a .76 points-per-game average. In the playoffs, Roenick helped the Flyers reach the Eastern Conference finals, scoring 4 goals and 13 points, including the series-clinching overtime goal in game six of the second round series against the Toronto Maple Leafs. The Flyers lost in the Eastern Conference finals to the eventual Stanley Cup champion Tampa Bay Lightning. Following the NHL Lockout, the Flyers surprised everyone by signing Peter Forsberg on August 3, 2005. In order to clear salary cap space for Forsberg's contract, Roenick was traded the next day to the Los Angeles Kings. Roenick's 2005–06 campaign with the Kings was greatly disappointing, both for Roenick and for the team. He managed 22 points in 58 games, his lowest total since he scored 18 points in 20 games in his rookie season. It was a trying season for Roenick who missed time due to a broken finger suffered while blocking a shot during a penalty kill, played games late in the season after suffering a chip fracture in his right ankle and, the concussion suffered from the slapshot had changed Roenick's game making him a tentative player. Roenick was displeased with his performances stating in an almost apologetic way "I went to LA to finish off the last year of my contract and had a year off playing and it was a really difficult year for me, it was hard mentally. A lot of people don’t realize that for six months I had a lot of problems with the concussions and battling the jaw injury …". Becoming a free agent at the end of his first season in Los Angeles, he expressed strong interest in joining a Canadian team. "It was a nightmare season from hell last year," Roenick said, "I've always said I would like to play in Canada before my career is over". Instead, Roenick signed a one-year, $1.2 million deal, on July 4, 2006, that sent him back to the Phoenix Coyotes. In Phoenix for his second tenure, he scored 28 points in 70 games (a relatively low scoring season for him). His second stint in Phoenix was not without its share of off ice issues as well. On December 12, 2006 Roenick left GM Place after finding out that he had been scratched from the games line up. Roenick went on record saying that he left the arena to go to a restaurant for what he called "a nice dinner". At the heart of the problem was Roenick felt that he was healthy enough to play in the game following a back injury and Coach Gretzky felt he needed more time. Roenick's antics led to him being benched again in the Coyote's next game. The next time Roenick was scratched he was more accepting of Gretzky's decision sating a different mind set following the news that his daughter, Brandi, had been diagnosed with the kidney aliment IgA nephropathy. After his low scoring campaign in Phoenix, there was speculation Roenick would retire. On July 4, 2007, The Philadelphia Inquirer reported that Roenick sent them a text message announcing his retirement from the NHL. Later that month, Roenick's agent, Neil Abbott, released a statement indicating that the "text message retirement" announcement by the Philadelphia newspaper had been premature, and that Roenick would be making a decision on his future within the next month. On September, 4 2007, it was confirmed that Roenick had signed a one-year, $500,000 deal with the San Jose Sharks, to fill the role of checking line center. Roenick has credited Sharks general manager Doug Wilson, his former roommate when they played together in Chicago, with giving him another chance at hockey. A month into his first season with San Jose, on November 10, Roenick scored his 500th goal, against his former team, the Phoenix Coyotes – an unassisted mark from center ice that bounced off the end boards, then hitting the side of the net, goalie Alex Auld attempting to clear the puck out of the crease from the side of the goal mouth, accidentally bumped the puck off the heel of his goalie stick into the net. Roenick became the third American-born player to reach the 500-goal plateau, joining Mike Modano and Joe Mullen. On January 10, 2008, Roenick scored his 503rd goal against the Vancouver Canucks, passing Joe Mullen for second in all-time scoring by American-born players. He trails his good friend and active Dallas Stars forward Mike Modano. As the Sharks entered the playoffs against the Calgary Flames, Roenick displayed an inspired Game 7 performance, scoring two goals and two assists to eliminate Calgary. Advancing to the second round to face Mike Modano and the Dallas Stars in Round 2, the Sharks were, however, eliminated in six games. Roenick also finished the season with 10 game-winning goals. On June 25, 2008, Roenick re-signed with the Sharks to a one-year, $1.1 million contract, doubling his previous salary. On February 21, 2009, Roenick earned his 700th career assist against the Atlanta Thrashers, by setting up a goal by Jonathan Cheechoo. He is the 48th player in NHL history, and the 6th American-born player, to reach that threshold. On August 6, 2009, Roenick announced his retirement from the National Hockey League. Roenick finished his career having scored 513 goals and 703 assists in 1,363 games, for a total of 1216 points. Jeremy Roenick was known for giving back to the fans. Whether it was signing autographs for fans by the players entrance or who came up to him on the street Roenick always tried to have a good rapport with the fans and reach out to them each day. For Roenick it was an understanding of what it meant to be the fan on the other side. As a child Jeremy attended Hartford Whalers' games; during one visit hockey legend Gordie Howe picked up a pile of snow off the ice and threw it over the glass and on top of Roenick's head, Howe then continued to skate around but looked at Roenick again and winked. Roenick recalled what a lasting effect it had on him, noting "I thought that was the coolest thing that ever happened in my whole life, it took three seconds. It was me, Gordie Howe and no one else...That moment stuck with me for years and years and years. It was little, it was small and it took nothing out of his power or time but it resonated with me my whole life. So, as a player, as I got older, I tried to reach out to fans, reach out to kids whether on the ice or on the street on in a restaurant. I try to do little things where I can make the same impression on a young child that Gordie Howe made on me. That’s a gift that was given to me. And I made sure I did it, every, single day. Without the fans, without their support, the NHL would be nothing, the NFL would be nothing, basketball, baseball, you name it right down the line ... The two or three seconds you give each day to make sure you appreciate the people who appreciate you, goes a long way." Even with his giving back to the fans Roenick was better known for his mouth, always willing to speak his mind. He was always a popular interview for reporters, he was one of a few players who spoke from the heart and never shied away from taking on the heads of the game, whether it was the Commissioner or the leadership of the NHLPA. It was Roenick's willingness to talk that got him into a famous trade of quotes in 1996. In the 1996 Western Conference semi-finals between the Colorado Avalanche and the Chicago Blackhawks, after a controversial game in which Roenick was tripped on a breakaway and no penalty shot was called, Patrick Roy said, "I would have saved it anyway." Roenick responded in another interview, "I'd like to know where Patrick was in Game 3 (a game in which Roenick had scored on Patrick Roy on a similar breakaway); probably up trying to get his jock out of the rafters." When later asked about Roenick's comments Roy retorted, "I cannot really hear what Jeremy says because I've got my two Stanley Cup rings plugging my ear." View the full website biography of Jeremy Roenick.